Billy Thomas, M.D., was named UAMS’ first vice chancellor for diversity. 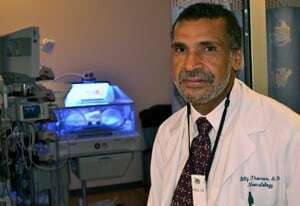 Sept. 2, 2011 | Billy Thomas, M.D., M.P.H., a neonatologist and leader of the UAMS Center for Diversity Affairs, has been named the first vice chancellor for diversity at UAMS. The appointment expands the center — which began in the 1970s in the College of Medicine — as a resource for diversity issues for the entire campus. The center already has an array of thriving programs for students from kindergarten through college to promote science and health care education, provide laboratory research experiences and offer preparation courses for the ACT, the pharmacy college admissions exam and the medical college admissions exam. More than 500 students participate in the various programs each summer. The center’s primary goal is to incorporate diversity and inclusion into the fabric of the institution. “We are integrating many of the diversity activities that exist within each college to become truly interdisciplinary and create an institutional environment that is certainly more productive of health care workers who have a sense of the whole patient,” Thomas said. Thomas said the role of the center is to develop and implement activities, partnerships and programs that set the stage for what UAMS wants to be as an academic health center in the next 10 years. The center’s partnerships include an alliance with the Graduate School to increase the number of minority students seeking doctorate degrees. Thomas noted that researchers tend to focus on areas in which they are familiar. Perhaps future minority researchers will find new ways to address health disparities in areas that disproportionately affect minority and disadvantaged populations, he said. In recent years, through a Health Careers Opportunity Program (HCOP) the CDA has undergone program expansion to include a literacy component. “Our partnership with a local literacy program has not only allowed us to address literacy as a key component to both the academic and personal success of students it has also allowed us to enhance our ongoing programs in the STEM — science, engineering, technology and math – areas,” Thomas said. The center has also been involved with the UAMS Head Start program since its inception. Staff members from the center serve on the Head Start Advisory Board and the center serves as a resource for diversity. “We can never start too early in preparing students,” Thomas said. Going forward, he said, the center will expand beyond its summer enrichment programs into the educational core) of each college and the institution. “We must make a solid attempt at addressing the larger issue of formally educating and exposing all students, faculty and staff to the inherent value of diversity and inclusion and the benefits of a culturally competent health care workforce – that is a workforce that reflects the diversity of the patients and students we serve,” Thomas said. Thomas earned his medical degree at UAMS and completed his residency in pediatrics in 1983. He received his Master of Public Health degree in 2004 from Tulane University. He is a board-certified neonatologist who for the past 25 years has served on the faculty of the Department of Pediatrics in the College of Medicine, most recently as a professor. His research focus has been vitamin D metabolism with an interest in rickets and low bone density in premature infants. In 2004, Thomas was appointed associate dean for diversity in the College of Medicine after serving since 1996 as assistant dean. In late 2008, UAMS established a a campus Center for Diversity Affairs and Thomas was subsequently appointed assistant vice chancellor for diversity. For more information on the Center for Diversity Affairs or its programs, visit http://cda.uams.edu.